This is SUCH a fun recipe for kids! First of all, kids love popping popcorn. If you don’t have an air popper, I’d recommend getting old school and making yours on the stove. I’m not sure which my onions like better – actually eating popcorn or helping me make it. They just squeal when (I totally let) a few pieces of popcorn escape and explode all over the kitchen. Secondly, you assemble and shake-to-coat everything in a brown grocery bag which they can be in charge of. I've made popcorn balls and a few other caramel corn recipes in my day and found them to be too sticky but this one proved to be just about dang perfect. And this totally surprised me but... I was kinda avoiding the pretzels because that's what I do with most snack mixes (sorry, pretzels) but when I finally ate one I fell in love! They're salty and sweet in the bestest kind of way! Add popcorn, pretzels and nuts to a standard-sized brown grocery bag. Fold bag closed and shake gently to combine ingredients. Set aside. Spray a large baking sheet with cooking spray. Set aside. Melt butter in a medium pan over medium heat. Mix in brown sugar and corn syrup and continue cooking on medium heat until mixture begins to boil; boil for two minutes. Remove from heat and immediately add baking soda. Stir in baking soda until mixture begins to foam (less than one minute). Pour caramel over popcorn mixture in brown bag. Fold bag closed again and shake until popcorn mixture is evenly coated with caramel. Pour popcorn mixture evenly onto the baking sheet. Bake at 200 degrees for one hour. Remove caramel corn from oven and cool completely before serving or storing. Store in an air-tight container. Use light or dark brown sugar or corn syrup. 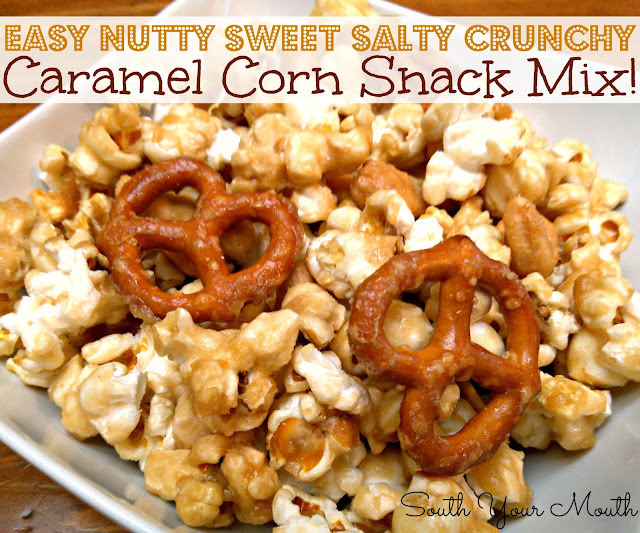 If you prefer the darker caramel corn like in Cracker Jacks then go with dark.